The Samsung B2100 is a durable phone with a rugged outdoor design; to say the phone is just “shock-proof” and “water-proof” does not really do justice to the phone’s design. The B2100 is a Quad-Band phone designed with military-grade specifications (MIL-STD-810F), intended for backpackers, campers and outdoor travelers all over the world. To make it a better outdoor companion, the phone includes FM radio, incandescent flashlight and 1.3MP camera with video capabilities. Cellular Abroad has been a retailer for the B2100 since September 2010, and it’s slowly becoming one of our most popular phone models; the simple, rugged design and ease of use make it perfect for cell phone novices. As with all of our phone models, we include the variable-voltage international charger and plug adapters. You can get your Samsung Xplorer B2100 with National Geographic SIM for only $179! 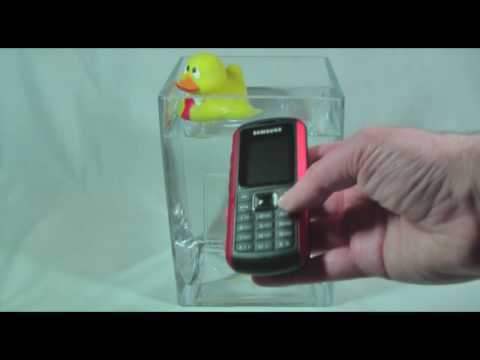 Samsung B2100 Solid Extreme: Does it work under water? I took this phone with me for a trip across Europe, to Copenhagen and then to Milan. The instructions were a bit confusing at first but after a call to customer service I was set straight. It seems like most people I hadn't read the manual first, and apparently you're supposed to wait to get a call from the phone before it connects. After that it worked like a charm. I got the data working eventually too so I was able to send gmail. I recommend this to any low-end users who need a sturdy phone for their next trip. This entry was posted in Cell phone hardware, Travel journal and tagged B2100, Cellphone, Samsung, Study Abroad, Travel, Travel Phone. Bookmark the permalink. I love this phone. It is waterproof, shock resistant and has a non-slip grip. It is quad-band gsm which makes it a great phone for international travel. I get great reception. I use this as a second phone for travel and outdoor activities. The only big irritation is that it does not get the time and date from your network, so you have to set the time and date everytime you take the battery out to insert or remove a sim card. I have even successfully run the java-based gmail app. It only uses edge data, but you wouldn’t want to use it for any web browsing since the screen is very small. Great back-up phone for the outdoors and travel. I like phones which have a good outdoor design. Especially, for people like me who work in the construction business can really benefit from a phone which is durable. Our phones drop endlessly during the day so we can not have a phone which breaks easily. I totally agree. I work in the construction industry and there’s no way on earth I would take a delicate Smartphone with me, it wouldn’t last a day! I have got a Caterpillar CAT B25 and it’s as tough as they come! This looks cool, is there a Blackberry water proof phone? also does this phone work world wide? We’d love to know about a waterproof Blackberry too! But this model does work around the world with any SIM.